July 2014 marks the 100th anniversary of the death of one of Birmingham’s most famous personalities. Joseph Chamberlain transformed Birmingham during the 1870s when he was the town’s Mayor. He later went on to represent Birmingham in Parliament and to serve in the cabinet as Colonial Secretary. He was a controversial figure during his lifetime and continues to be so today. 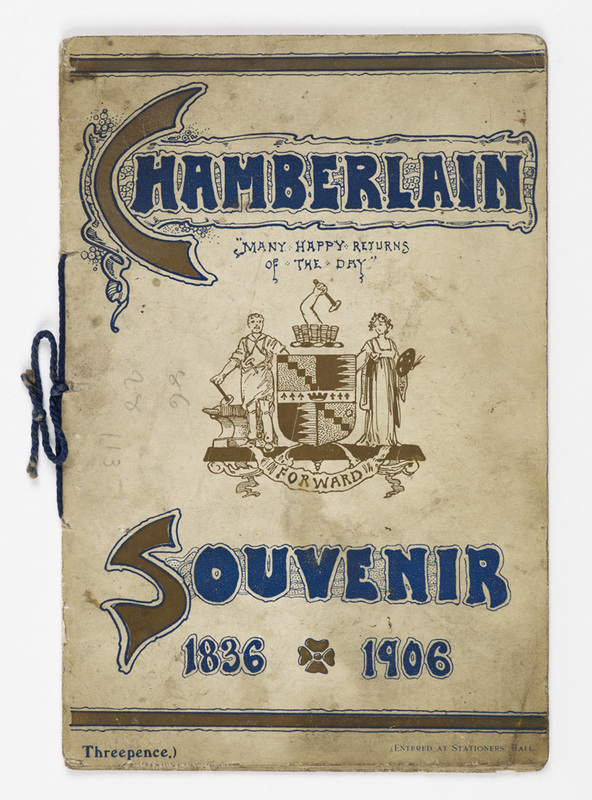 This is a series of snapshots from Chamberlain’s career, based upon objects in our collection. As Mayor of Birmingham, Chamberlain ran the town like a business, taking utilities like gas and water into public control. He improved the health of the population through better sanitation. One of his most controversial acts was the demolition of large swathes of ‘slum’ housing which made way for the commercial centre of Corporation Street; this enhanced the business environment but many people were displaced and not re-housed. On 17 June 1874 Chamberlain laid the foundation stone of the new Council House, which still stands at the heart of Birmingham. 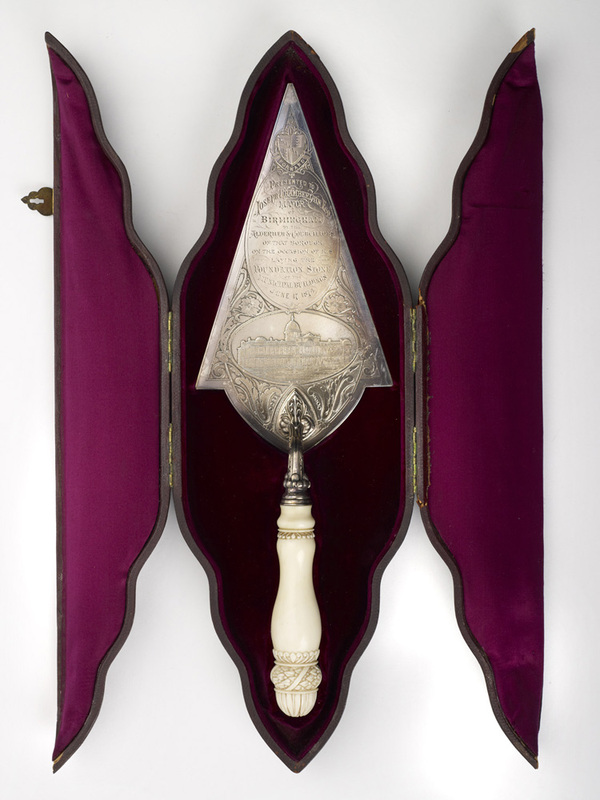 This trowel commemorates the event. Chamberlain’s personal life was beset by tragedy. His first and second wives, cousins Harriet and Florence Kenrick, both died in childbirth. At the age of 52, Chamberlain found happiness with 23 year old American Mary Endicott. 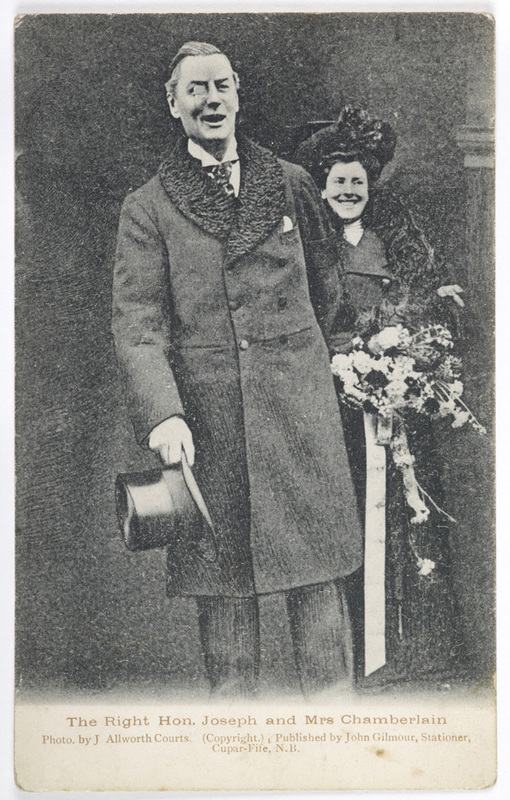 Images of Chamberlain usually portray him as looking severe, but in this postcard we get a rare glimpse of him smiling. In the 1890s the British government was keen to keep South Africa within the British Empire rather than see it become a Boer republic. In 1899 Chamberlain, now Colonial Secretary, was preparing for war against the Boers. 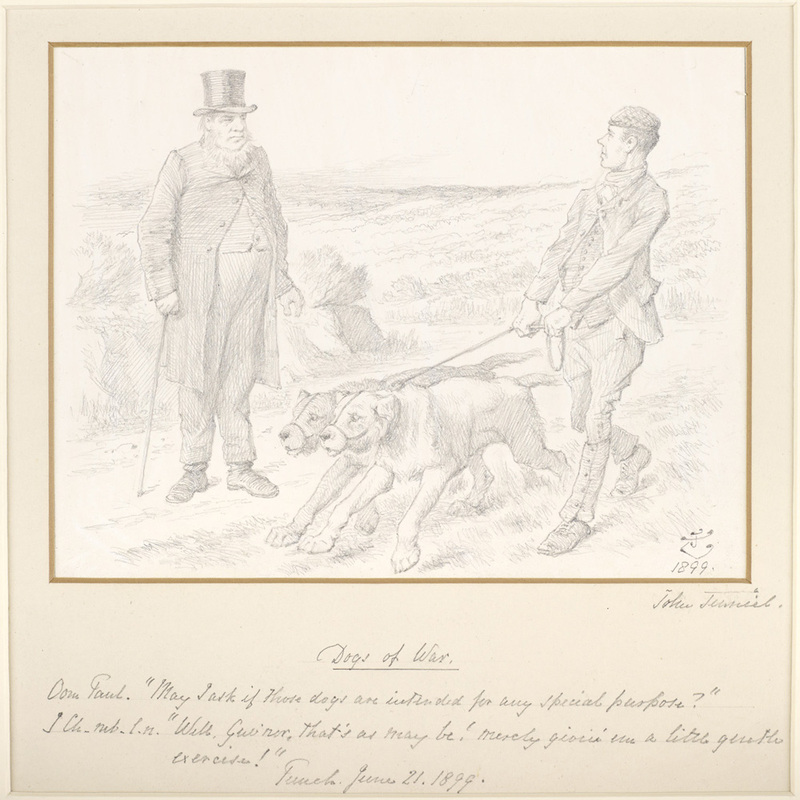 In this caricature, Chamberlain pretends to ‘Oom Paul’, the President of the South African Republic, that ‘the dogs of war’ (a quote from Shakespeare’s Julius Caesar) are just going for a walk. This cartoon was published in Punch. The Boer War came to an end in 1902, and in the following year Chamberlain toured South Africa to promote reconciliation between the British and the Afrikaners. He was broadly welcomed, and persuaded the Prime Minister John Gordon Sprigg to hold elections. 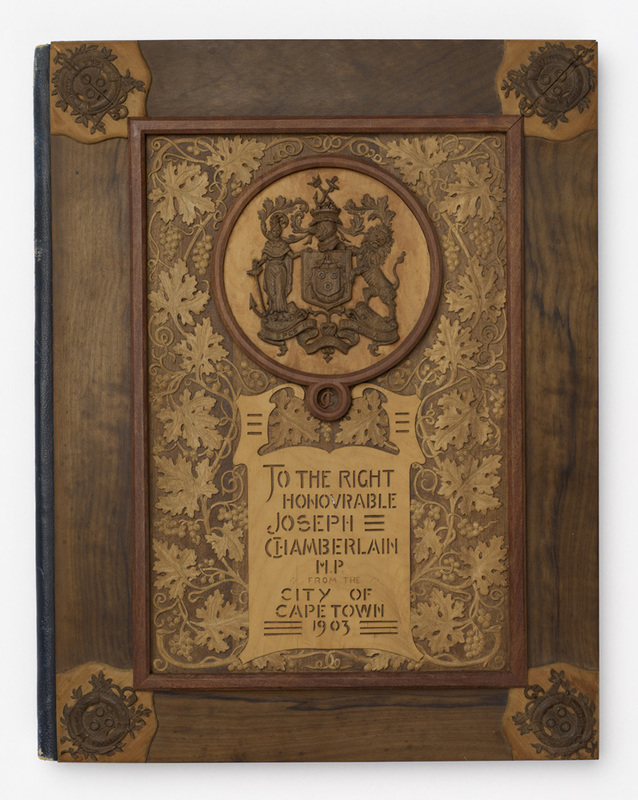 This elaborate wooden blotter was presented to him by the South African Progressive Association. It is lined inside with blotting paper and was used to blot letters to ensure that the ink was dry. In his early career Chamberlain was a radical reformer, but later he became increasingly imperialist. 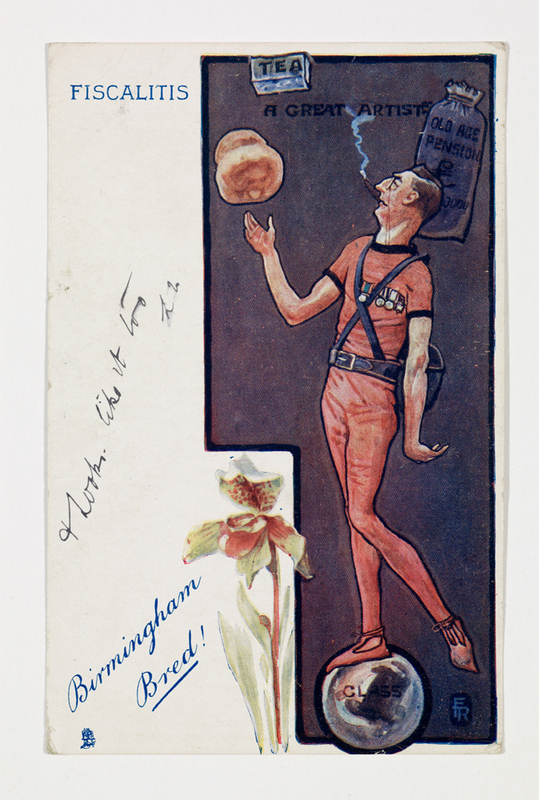 This satirical postcard pokes fun at a variety of policies that Chamberlain ‘juggled’ as Colonial Secretary. One of his last campaigns was for the imposition of tariffs upon trade with countries outside the British Empire, in order to favour imperial trade. He became notorious for using two loaves of bread as visual aids during a speech in Birmingham, arguing that a loaf baked under tariff reform would be no more expensive than one baked under free trade. The phrase ‘Birmingham bred’ is a pun on this. Despite his mixed fortunes as a national politician, Chamberlain was always a popular figure in Birmingham. Throughout his career he used a monocle and wore an orchid in his buttonhole, and his instantly recognisable image was reproduced on countless souvenirs. His 70th birthday in 1906 was marked by huge celebrations and a parade through the city centre was attended by thousands. This souvenir programme cost threepence. To see more objects from our Chamberlain collections, visit ‘Birmingham: its people, its history’ on the third floor of Birmingham Museum and Art Gallery, or see our Chamberlain Flickr page.